NSTA is excited to announce a free app for the Next Generation Science Standards, in partnership with Mastery Connect. You can download the Next Generation Science Standards app by searching "MasteryConnect" or "Next Generation Science Standards" in your app store or by visiting the iOS Store, Android Marketplace, or Windows Store. The Next Generation Science Standards app gives you multiple ways to view the standards, including DCI and Topic arrangements, and also includes convenient search functionality. 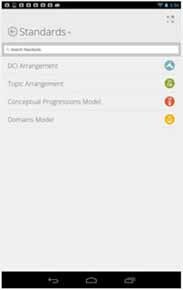 The app also makes referencing standards in the Common Core simple by providing linkage between the NGSS app and MasteryConnect's Common Core app.